Hello and welcome to Auntie Marg's craftroom, here is my first tutorial, please leave me a comment and let me know what you think of my first one. The long cards are for my personal stash and the 5.5 Birthday cards are for Operation Write Home. I'm working on a video hopefully it will be up in a couple of days, also I'm thinking about opening an Etsy shop any feedback on that idea would be great. 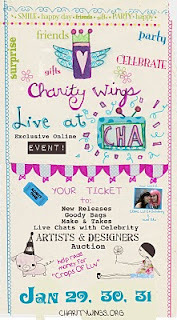 Want to see whats at CHA this year and help Critically ill children, heres you chance. 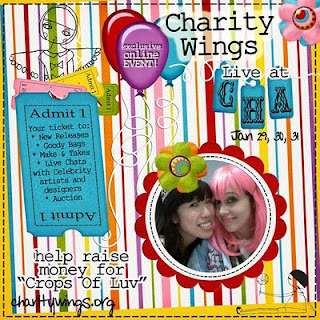 Join the live feed straight from CHA and help Crops of Luv make scrapbooks for kids. Click this link and get all the details. I thought I would try my hand at stick-pins just using misc. beads from Michaels and floral pins from the wedding section, I also didn't like just the plain pearl tops on the pins so I colored them with ranger alcohol ink and I think they came out really cute. This card was made with Stampin up cardstock and the background paper I stamped white cardstock with stampin ups Triple line Plaid wheel that I unmounted and used on my acrilic block with pear pizzazz, rich razzleberry and crumb cake. I'm really happy with how the background came out. Just a few Cards that make me smile, I really love the happy face one. Ok here it comes, this year I'm going to teach myself how to make videos for my blog. I finaly got a video camera and most everything I do is self tought so wish me luck and send me tips you already know. Comming soon Videos!! I hope these bring families that are far apart a little closer together.